Home » 2007 » EVA-00 Rebuild of Evangelion Ver. From the New Evangelion movie, Rebuild of Evangelion, comes Rei Ayanami’s Unit 00. 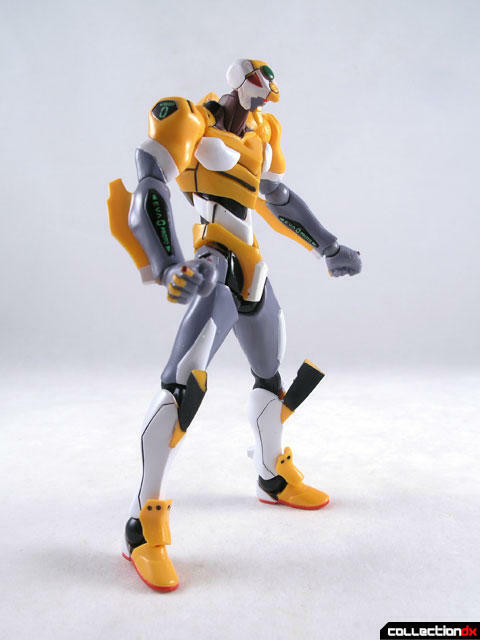 Kaiyodo could have been lazy here and just repainted the previous Revoltech Eva 00 but instead they went ahead and created an all new version of the yellow Eva robot. 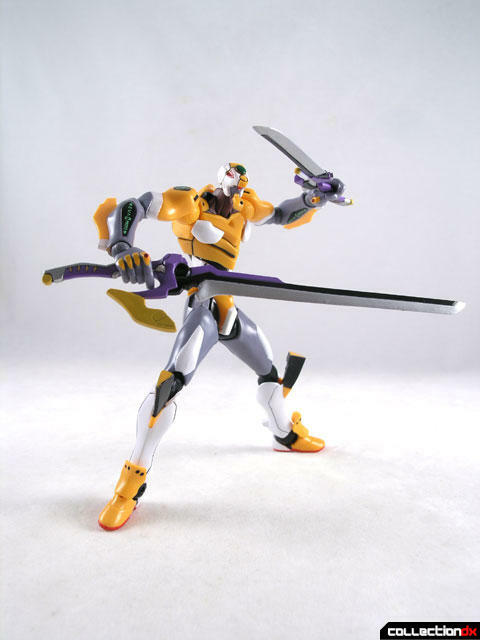 The Revoltech EVA-00 Rebuild of Evangelion Version is the 33rd entry into the Revoltech Series. This is a whole new figure from the ground up. Most noticeably different is the coloring. 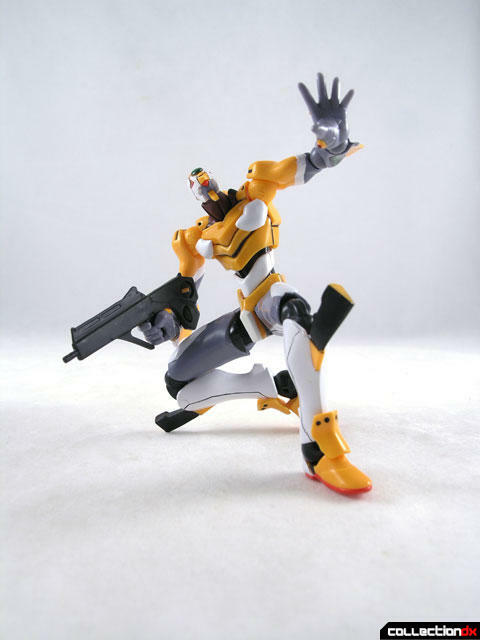 While the previous Unit 00 figure was almost all yellow, this new version works in more grey and white. The toy also uses a larger, more imposing sculpt and better use of Revoltech Joints. The head is on a dual Revoltech joint and the shoulders now have appropriately colored joints. An interesting thing to note is that the white chest pieces are actually attached to the peg of the Revoltech joint, so there is a small bit of movement there. The waist joint is a Revoltech joint and it’s hidden behind a plate this time. The hips and upper thighs are swivel joints, and the knees now get DOUBLE JOINTED Revoltech joints. To be honest, a lot of these accessories look like they belong with the Unit 01. 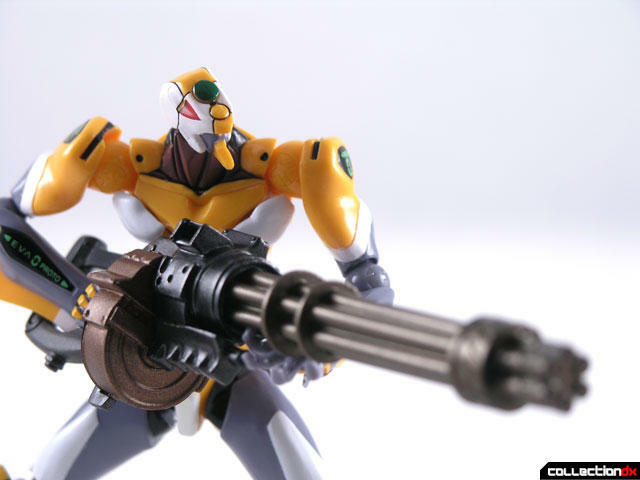 Both swords are the same purple as the 01, and the large gatling gun is shown on the box being held by Unit 01. Perhaps they thought the Unit 01 already had too many accessories? It wouldn’t be the first time Kaiyodo packaged accessories from one figure in another figure’s box. There could be a logical reason for this, but alas, I haven’t seen the movie. Now I know some of you are suffering “Eva overload”, and the LAST thing you want to buy is another Eva toy. But a lot of people LOVE Evangelion, and these versions are the best representation of the movie style evas yet. Regardless of the character, they are really nicely done toys. 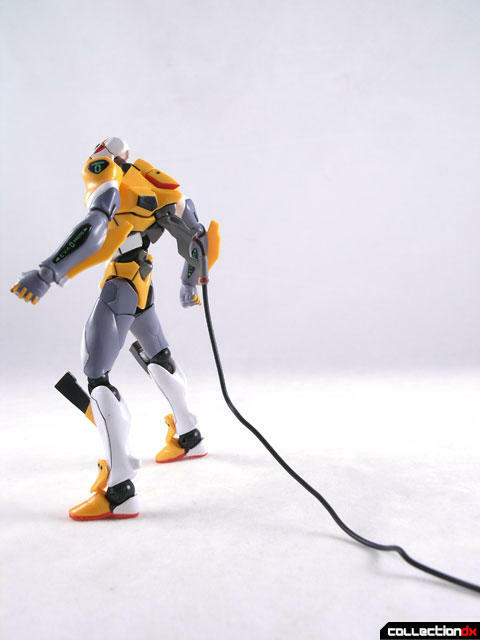 The Revoltech EVA-00 Rebuild of Evangelion Version is available from HobbyLink Japan. At the time of writing, I only own a mere six Revoltechs. This one was my third, and it may just be my favorite. 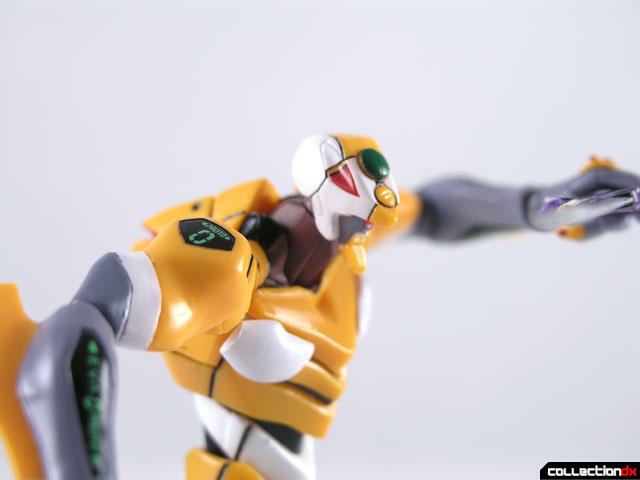 It has my favorite assortment of awesome accessories, I love the color scheme, and I love the look of an EVA without the vertical shoulder fixtures every now and then. And of course, it goes without saying that the posability is great. I noticed that the images from the company page and the box show a different figure. Black shoulder joints instead of yellow and other paint job issues. There are a few other versions of Unit 00 in the Revoltech line. Are you talking about this one, by any chance?